Small bottles of Champagne are becoming increasingly popular. There are different types of small bottles - and even Champagne in a can - that work great as party favors and for gatherings like bridal showers. Here is everything you've ever wanted to know about these diminutive bottles. A quick primer about the term Champagne is necessary. While true Champagne comes from the Champagne region of France, other sparkling wines that are made in the traditional French Méthode Champenoise are also commonly referred to as Champagne. This includes sparklers from America, Australia and other wine regions around the world. They're cute - and they're practical, too. Small bottles of Champagne come in a variety of types and sizes. The bottles still have corks, so you get the characteristic "pop" when you open them. Here are the small bottles you can get. 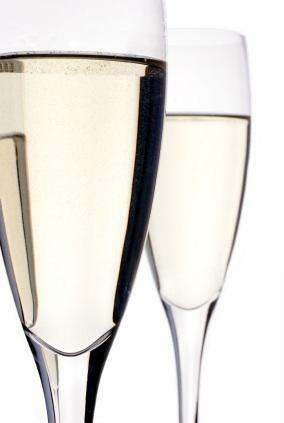 Splits of Champagne are a quarter of a size of a regular 750 mL bottle of Champagne. This means the bottle is 187 mL, which is equal to two small glasses or one large glass of Champagne. This might also be known as an "individual" or "single serving" bottle, and they often comes in packs of four. A half-bottle is exactly what it sounds like. It is half of the standard 750 mL bottle, or 350 mL, which will pour about three regular glasses of Champagne. Canned Champagne has hit the wine shops. While technically not a bottle, it is an individually sized serving that is equal to a split of Champagne. Cans come in four-packs. For one or two people, a full 750 mL bottle of Champagne may be too much, since you should drink Champagne shortly after opening it in order to maintain the integrity of the bubbles. A half-bottle is the perfect size for two people. Individual bottles make fun party favors. If you mix it up and offer a variety of different brands and types of Champagne, then you'll have something that everyone can enjoy when you entertain. If you want a glass of Champagne, but your partner doesn't, then you can have one without having to open an entire bottle. It's easy to take small bottles or cans with you on the go. Be sure to obey open container laws if you plan to drink the Champagne in public places. Ordering a split of Champagne in a restaurant is the perfect way to get a single serving of Champagne without having to order the entire bottle. Most restaurant menus contain at least one split and/or half-bottle. There are disadvantages to small bottles, as well. If everyone has an individual bottle of Champagne, there is more packaging waste than if you opened a single bottle for a group. Small bottles are typically less cost-effective than buying the same amount of Champagne in a 750 mL bottle. There is less Champagne selection with smaller bottles. Most Champagne manufacturers make half-bottles of Champagne. Splits and cans are a bit tricker, but you can find them. Here are a few brands. Pommery POP makes little golden splits of Champagne that are a lot of fun. One of the things that makes these bottles unique is that they contain vintage Champagnes instead of the non-vintage wines that most manufacturers put into small bottles. Pommery POP also makes a non-vintage blend Champagne that comes in a cute cobalt blue bottle, and a rosé in a pretty pink and silver bottle. Perrier-Jouët NV Grand Brut Champagne comes in splits. This is a well-rated, consistently good Champagne from one of France's most respected brands. Another of France's respected winemakers offers splits. You can get Moët et Chandon NV Imperial Champagne for about $10 a bottle. Francis Coppola offers Sofia blanc de blancs in a hot pink can that comes in four packs. Tiny bottles filled with tiny bubbles are a fun way to have your Champagne. Talk with your local wine shop and find out which Champagne options are available in smaller-sized bottles.